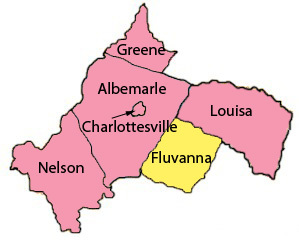 Fluvanna County is on the southeastern border of Albemarle County. An article on Wikipedia has information about Fluvanna County in areas beyond Albemarle County's borders. Fluvanna is a member of the Thomas Jefferson Planning District. Fluvanna County experienced significant budget shortfalls for the 2013 fiscal year, resulting in complete cuts to funding for regional groups Jefferson Area Board for Aging, JAUNT, Offender Aid and Restoration and StreamWatch. ↑ Web. Analyzing area's growth will be key for future planning, Daily Progress, World Media Enterprises, February 5, 2011, retrieved February 9, 2011. ↑ Web. Virginia Population Estimates, Website, Weldon Cooper Center for Public Service, January 30, 2017, retrieved April 4, 2017. ↑ Web. Fluvanna County Unveils Plans for Riverside Trails, Matt Telheim, News Article, NBC29, April 4, 2017, retrieved April 4, 2017. ↑ Web. Fluvanna County Neighbors Rally Against Proposed Water Lines, Sean Cudahy, NBC29, October 16, 2015, retrieved October 18, 2015. This page was last edited on 4 April 2017, at 20:32.